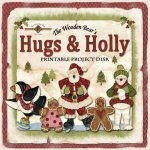 I used the characters from my Hugs & Holly fabric line that we released in 2012. I've always wanted to do more with my characters, and this was just the perfect way to use them! The disk is $ 10, just like Boppity Boo. 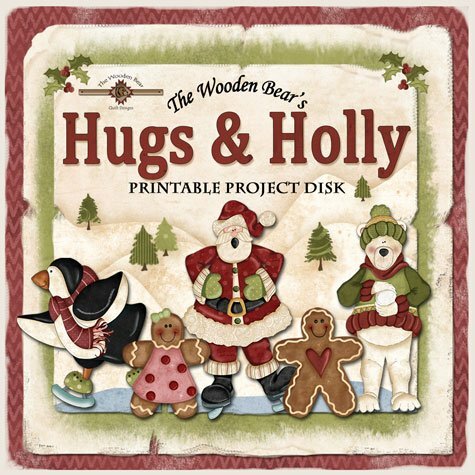 It's jam-packed with projects that you just print, cut, and then glue or paste together! Some of the projects use boxes or bags, and we have those available on our website. But you can also print the graphics and use them on other items- just be crafty! Then there are other projects like gift card holders, money holders, triangle treats, and candy bar wraps! Below are some pictures to help tell the story. If you have any questions, just ask! The disk contains jpg, png, and pdf formats, and can be used with Silhouette Studio software. 6 different sets are included on the disk. Each set makes the same projects, but features a different character and colors. The complete Santa set is shown below. The other sets are the polar bear, penguin, gingerbread boy, gingerbread girl, and Merry Christmas. Note: If you need the boxes or bags used to make the projects, see our "Packaging, Wrapping and Crafting" category under PRODUCTS. Click here if you would like the one-page flyer containing the disc information and pictures. Here's the money card holder from the gingerbread boy set. Simply print, cut, tape! Here's a close-up. The crimps along the edge were made with a crimper tool I found at the craft store, but you could also use a credit card, or straight edge, and just fold back and forth to achieve the same effect. Here's the Merry Christmas gable box, shown closed. ...and from the side. Notice the "Tear Here" line. Perfect for M&M's or small treats! There are two sizes of graphics for the bags. The large graphic will also fit on the composition book covers. We used a similar project (exact same size) for the Boppity Boo Printables Disk. Click here to see a composition book cover and other projects from the Boppity Boo Printables Disk. These are sweet, little wraps for Hershey Nugget chocolate candies. These would be so cute packaged in a pillow box! There are also just some extra little graphics, like each character by itself, to use on whatever projects you want! Use them for scrapbooking, cardmaking, or fun crafts for kids! Now it's time to start some Christmas projects!! !